Japanese firm Teleglass has unveiled its latest pair of video glasses. Besides support for the Apple iPod and a display equivalent to a 45-inch TV positioned 2m away, the Teleglass T4-N glasses have a more discreet design compared to rivals, the firm says. By placing the two displays close to your eyes, the T4-N video glasses are able to offer a large screen view, according to Pink Tentacle. 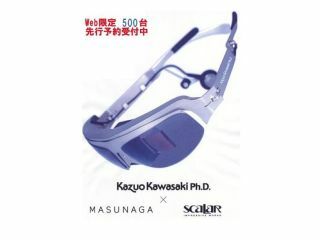 While other video glasses normally look like something out of a sci-fi movie, Teleglass has worked with spectacle designer Kazuo Kawasaki to make the unit less conspicuous for other people to look at. The result is a pair of fairly discreet video glasses complete with frame-mounted earphones, weighing just 30g. The two tiny displays offer a 4:3 screen resolution of 640 x 480 pixels, which Teleglass said is equivalent to watching a 45-inch TV at 2m distance. The unit can be fed with video from any NTSC video player, such as the Apple iPod. Battery life is said to be between two and four hours. In Japan, the video glasses will cost ¥134,400 (£562), and are limited to just 500 pairs. It looks unlikely then that the glasses will go on sale over here.